As you all know, I went to LA a couple of weeks ago for the Pete’s Dragon premiere. One of the other fun things that we did while there was watch the bonus content on the BluRay of The Jungle Book, plus we got to do interviews too. Have you ever taken the time to watch some of the bonus content reels on these Disney movies? You need to! Seriously! So much fun info. That said, the real reason I am talking to you today…. 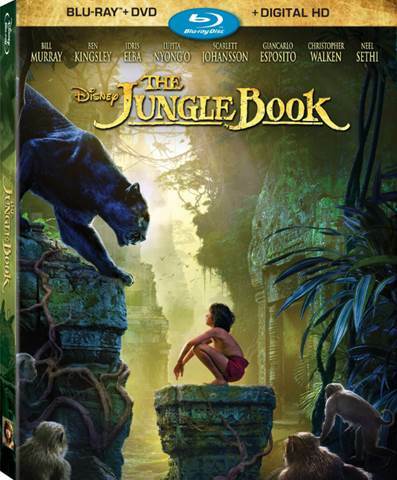 The Jungle Book is NOW available in stores and online! You need to get your copy! If you saw the original Jungle Book movie, you know the feels this story has. The live-action version has just as much, if not more as you see this incredible little boy, growing up in the forest with the wolves. He really considers himself part of the pack. That connection between him and the other animals in the forest is all too real. Neel Sethi does an absolutely amazing job at portraying Mowgli and the talent he has, pretending these tennis balls and green screens are REAL animals, just WOW. The story takes you through the jungle, gets you connected to the animals and you fall in love with it all over again, just like the original. The cast is just PURE GOLD. Bill Murray (“Lost in Translation” and a million other great movies) as the voice of Baloo, Sir Ben Kingsley (“Learning to Drive,” “The Walk”) as Bagheera and Lupita Nyong’o (“12 Years a Slave,” “Star Wars: The Force Awakens”) as the voice of mother wolf Raksha. Scarlett Johansson (“Avengers: Age of Ultron”) is the snake, Kaa, Giancarlo Esposito (“Breaking Bad”) is the voice of alpha-male wolf Akela, Idris Elba (“Beast of No Nation”) roars as the voice of Shere Khan, and Christopher Walken (“The Deer Hunter”) lends his iconic voice to King Louie. See Idris Elba as Shere Khan was fantastic! His voice was just perfect. If you didn’t know, Bill Murray and Christopher Walken actually SING in this movie too! The tracks that were produced for the movie are just incredible. They did justice to the original and yet were original, catchy and FUN. Get your copy of the The Jungle Book today!